To understand Little Boris, we must first turn the pages back to the year 2008, when Tatuaje first unveiled the legendary Monster Series with a cigar known as The Frank. And while this series went on to span a massive collection of 13 cigars, there was once a more grandiose plot twist... Pete planned to accompany each Monster Series cigar with another release named for the actor that played said monster (brilliant, really)! This series, dubbed the Actor Series, was kicked off with Tatuaje's The Boris cigar—the first and (almost) only release in a collection that proved too difficult to execute (13 monsters is difficult enough!). 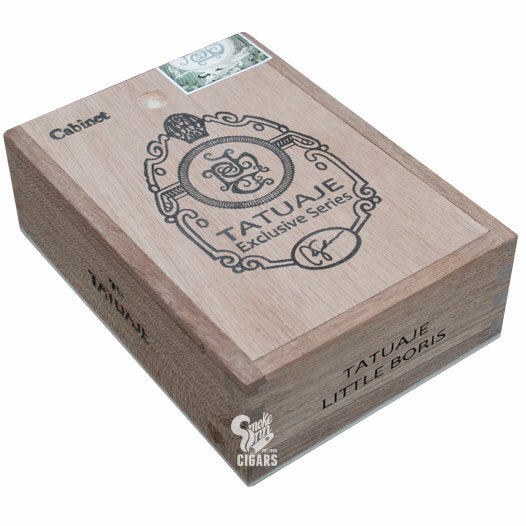 But the defunct series was not quite dead, with Tatuaje debuting the surprise release of Little Boris in 2012. The concept was similar to an offshoot of the Monster Series itself (Tatuaje Little Monsters), offering the same blend as the full-sized The Boris cigar in a smaller robusto format. The original Little Boris was even more limited than its larger sibling, being released at a single retailer with only 500 boxes of 10 cigars. Needless to say, Little Boris reached "unicorn status" rather quickly, becoming a hot item on secondary markets. Thankfully, with 2018's re-release, Pete Johnson has produced enough Little Boris to go around—ramping up production to 1,500 boxes of 10 cigars nationwide! The cigars share the original size and blend of Little Boris (all-Nicaraguan filler/binder and an Ecuadorian Sumatra wrapper), but the primary bands have been color-inverted (what was white is now black, etc.). This allows collectors and enthusiasts the ability to distinguish the cigars from the original release. While the majority of 2018's release went to the original Little Boris retailer, the remaining stock was sent to 20 random retailers across the country—this includes yours truly... meaning craft smokers are advised to "pull the trigger" on these rarities like they're going out of style!